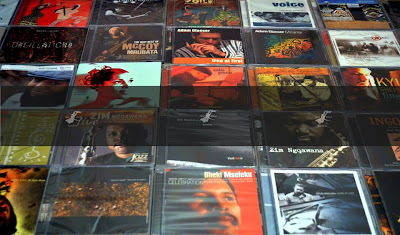 LondonJazz: South African Jazz Heaven? I may be slightly too early, but this initiative from Moeti Moumakoe from Soshanguve, north of Pretoria may yet be what a lot of us have been looking for for a good while: a specialized source of CDs from the recent/ current South African jazz scene. (The mass-market outlet which I've tried with varying success is kalahari.com). Moeti's JAZZ ESSAY RECORD BAR has a Facebook Page, and from the evidence of this photo, some stock too! Anything which can help to get this music more available has to be welcomed.